All schools closed – but their blogs are busier than ever! This week, along with many local councils, East Lothian reluctantly took the decision to close all its schools in the face of unprecedented severe weather. It wasn’t long, though, before staff started to use their eduBuzz school blogs to post updates for their classes. And it’s been interesting to see how that has developed over the four days the schools have now been closed. eduBuzz.org has been going since 2005, and there are now over 1000 blog sites and over 2000 registered users. Perhaps more significantly, the use of simple web publishing has become normalised across the 40-school district, and a good staff and student skill base has been built up in almost every school. 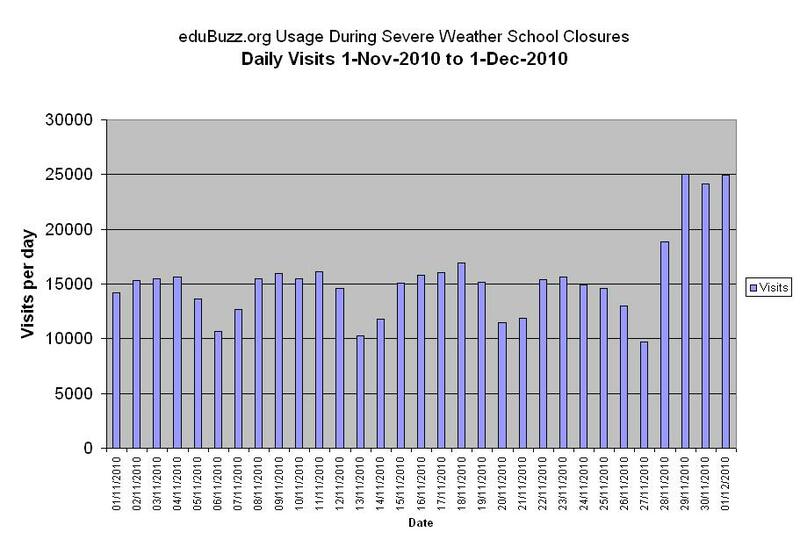 Usage has been rising steadily, and before the school closures there were about 700 posts in a typical school week, and around 1200 comments. With schools closed, you might have expected usage to drop; but the opposite has happened. It started with small numbers of staff posting learning activities for their classes. That trickle quickly became a flood as the closures were extended, and staff realised the potential of the blogs to keep some learning going. By midday today, a running counter of “posts in the last 24 hours” showed over 700 posts had been added since yesterday lunchtime, a record level of activity. Education managers quickly realised what was happening, and arranged for school closure updates on the East Lothian council web site to point parents and students to the school blogs for learning updates. Visitor statistics showed they weren’t publishing into a vacuum either. Visits per day have been higher than ever, at over 25,000 visits per day. Some of these will be due to people checking for closure announcement information, especially mid afternoon in the earlier days, but the levels of activity have been high at all times. It has been heartening to see the efforts being made by staff to “keep the show on the road”. Many staff have asked for help to enable them to do things they’ve never done before, whether it’s putting up a simple post with a learning activity, or recording themselves reading stories to their class, and publishing the recording on the school site. And some, of course, has just been good fun – such as finding out what two feet of snow look like! This entry was posted in Professional and tagged Blogging, blogs, edubuzz, ICT Benefits, Parents as Partners, WordPress on 2 December, 2010 by David Gilmour.